Tribal Worldwide London, adam&eveDDB and Snapchat have come together to create the world’s first mobile phone-based interactive GTI race track for Volkswagen UK, connecting with GTI admirers across the UK and using cutting edge Augmented Reality (AR) to celebrate the joy of driving and deliver the latest instalment of the Volkswagen GTI ‘People’s Supercar’ campaign. 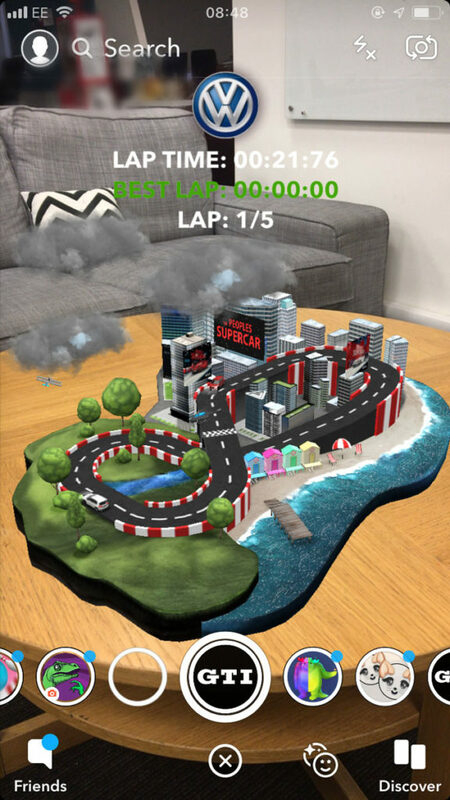 The GTI race track is a bespoke 3D model of a race circuit, which users can interact with through Snapchat’s AR lens. The track is made up of forests, beaches and cities, which users can race the GTI around by tapping and holding on the screen; the longer they hold, the quicker the GTI goes, although they have to be careful not to get carried away around the track’s hair-pin corners. Drivers can then go beyond the platform and spread the joy of driving by sharing their results with friends and competing for the best GTI lap time. Tribal was tasked with helping Volkswagen UK achieve a key business objective of further improving its already strong brand likeability. Their latest response is a campaign rooted in the positive sentiment that surrounds the GTI – a family of ‘hot hatch’ cars loved by petrolheads and everyday drivers alike. Tribal found this audience was most successfully reached via Snapchat, and in a collaboration with adam&eveDDB, the three companies have teamed up to create a playful campaign that enhances smartphone users’ fond feelings felt for the GTI, and therefore Volkswagen. The GTI race track, which can be accessed by scrolling through Snapchat’s VR lenses, will be available for a month from 19 November.